Viewers howled while tweeting their brains off. Myself included. Now Syfy is giddy, oh so giddy, with Wednesday night’s national ratings and social media bonanza for a little thing called Sharknado 2: The Second One. The network says it drew 3.9 million viewers, with 1.6 million of them within the advertiser-prized 18-to-49 age range. That made it Syfy’s most-watched original movie ever, with a 183 percent increase over the total audience for last July’s original Sharknado and a 190 percent uptick in 18-to-49-year-olds. Syfy also is touting Sharknado 2 as “the most social movie on TV ever,” with a staggering one billion “estimated impressions for Twitter conversations.” Furthermore, Sharknado 2 at one point “held all top 10 trending topics in the United States,” even drawing more mentions than Miley Cyrus’ twerk-fest at the 2013 MTV Video Music Awards. Sharknado 2 also had more 18-to-49-year-old viewers Wednesday night than competing programs such as CBS’ Extant and Fox’s So You Think You Can Dance. 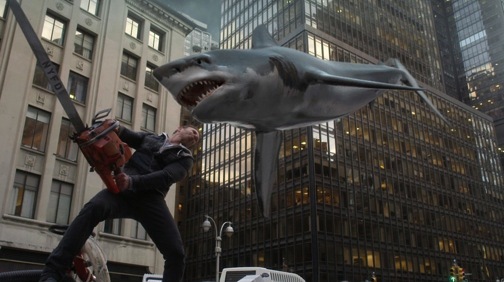 Yes, a Sharknado 3 currently is in development for next summer. Just so they don’t go to waste, here are some of my live @unclebarkycom tweets during Sharknado 2. ***Al Roker’s work in #Sharknado2TheSecondOne finally qualifies him for AMS Seal of Approval. ***Statue of Liberty head as lethal bowling ball best spec effect in #Sharknado2TheSecondOne. Some will see as optimum way to protect border. ***That’s legendary Herb the Shark fighting Fin right now. Worked for scale so he could be part of this prestigious picture. ***Most unbelievable scene in #Sharknado2TheSecondOne. A Met hits a home run. ***News of showman Robert Halmi Sr.’s death comes during #Sharknado2. Perhaps fitting. He had pirates attack Noah’s Ark in big NBC splasheroo.